Q. Can people or pets hear the deer whistle from inside the vehicle? A. No. The sound is emitted in front of the vehicle. Q. Where on the vehicle should I mount the deer whistle? A. We suggest mounting in the grill if possible to allow maximum air flow. You also can mount to the top or bottom of the bumper. Try to keep the whistle level with the horizon when mounting to allow maximum air flow. Also, be sure to mount with the large holes facing the roadway and the small holes facing the vehicle. Q. If I install the whistle on my vehicle, will I never hit a deer? A. 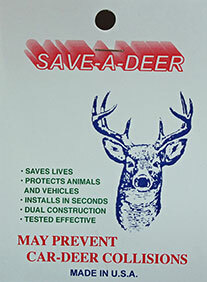 The Save-A-Deer whistle is not a miracle device, although it is a highly effective deterrent against deer/vehicle collisions. Our whistle has been tested over 90% effective. Q. Why is the Save-A-Deer whistle better than other air-activated deer whistles? A. Our whistle has been tested and found to be over 90% effective. Other whistles tested were considerably less effective. Please refer to our research page for more information. Our whistle is also smaller and less conspicuous than any others on the market. Our whistles can be mounted in the grills of most vehicles, which can prevent the whistle from being knocked off by accident. Q. How do I know if the deer whistle is working? A. Watch for animal reactions as you proceed along the road. Always check to make sure your whistle is clean and free from debris or bugs. Q. How does the deer whistle mount? A. The whistle is mounted with aircraft quality double stick tape which adheres directly to the vehicle. Always clean the surface area before mounting the whistle. Always try to keep the whistle level with the horizon. Q. At what speed does the deer whistle work? A. At speeds of 35 MPH and greater the whistle is working. Q. Do I need two (2) deer whistles for my vehicle? A. No. Our product is a single unit which is very small and convenient to mount. It works great for motorcycles. Q. Will the whistle scare the deer away? A. The whistle will alert the animal of your approaching vehicle with sufficient time to avoid a costly collision. Deer are a highly skittish animal and will normally react to the whistle by stopping, looking, and listening to determine if they are being threatened.